Raymond had moved to the UK and was living at various London addresses in the 1930s, later moving to Wimbledon where he was living after the war. During the 1930s he wrote a number of plays for broadcast on the BBC (mostly for Midland) including the burlesque (in rhyme) The Marmalade Mystery (1935) and the series The House Next Door (1936), the Christmas revue Folly and Mistletoe (with others, 1936), the series How to Make the Best of... (1937), the comedy Twenty-one Days at Sea (1937), Seeing Life (1938), and This Week's Films (1943-44) for the Forces. Raymond was also the film and television critic for the Sunday Dispatch. Raymond was one of the earliest authors to become associated with Eagle, appearing with a Western serial, 'Lash Lonergan's Quest', in the first 14 issues (14 Apr-14 Jul 1950) and following that with the short stories 'The Clue of the Chopsticks' (2 Feb 1951) and 'He Fell to Fame' (30 Mar 1951). Soon after, another serial appeared in Girl, 'Diana Down Under' (28 Dec 1951-1 Feb 1952). However, it was in Swift that his most enduring character, 'Smiley' appeared. Smiley was a young Australian boy, William Thomas Greevins, who was constantly falling into adventures in the Australian outback where he attended Murrumbilla State School. Amiable Smiley and his pals had appeared in two novels by Raymond in the 1940s, Smiley and Smiley Gets a Gun, but it was Raymond's connection with London Film Productions in the 1950s that helped him bring Smiley to a wider audience when he adapted his first novel for the big screen in the eponymous 1956 movie starring Ralph Richardson. The screenplay, co-written by Raymond and director Anthony Kimmins was nominated for a BAFTA award for Best British Screenplay in 1957, losing out to Nigel Balchin's The Man Who Never Was. Kimmins (best-known for his early comedies starring George Formby), again co-wrote the screenplay for Smiley Gets a Gun, the 1958 sequel, this time with Rex Rienits. Smiley was played by Australian Colin Peterson in the former (he went on to briefly play drums with the Bee Gees!) and Keith Calvert in the latter. Smiley began appearing as a colour strip in Swift on 9 August 1958 and ran until 2 April 1960, during which time Raymond also wrote a new novel, Smiley Roams the Road for Hulton Press' 'Swift Novels' series. 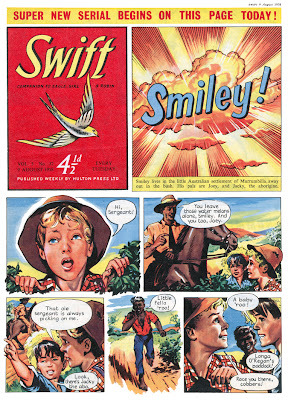 The comic strip appeared on Swift's cover and was nicely drawn by Harry Bishop. Moore Raymond died in Barcelona on 13 June 1965, aged 62. Smiley. London, Sylvian Press, 1945. Smiley Gets a Gun. London, Sylvian Press, 1947. Smiley Roams the Road, illus. Pat Nevin. London, Hulton Press, 1959.